Let your chair work for you, not against you. The Amia Drafting Chair by Steelcase is supportive in all of the right places, flexing with you as you move and work throughout the day, all while giving you a little extra height. 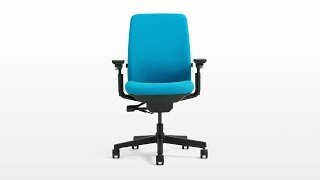 Supreme adjustability and supportive LiveLumbar technology let users of all sizes sit comfortably and in your body's preferred positions at work. This popular, affordable ergonomic chair also features an adjustable lumbar support pad, fully adjustable arms, intuitive seat depth adjustment, and supportive cushioning in the seat and back. Its wide range of adjustability means that the Steelcase Amia Drafting Chair will easily seat a wide range of users, from petite to big and tall sitters. These high-end ergonomic features will keep a wide range of users feeling healthy, comfortable, and supported for long sitting sessions, letting you work in greater comfort than you thought was possible. The Steelcase Amia Drafting chair is available in your choice of Black, Platinum, or Platinum with Merle frames, with or without a polished aluminum base. The Steelcase Amia Drafting Chair is available with or without arms. We highly recommend Steelcase arms because they're some of the best on the market. The highly adjustable arms move in and out, forward and back, up and down and pivot, so you can find the exact position for optimal support and comfort. I have low back problems (degenerative discs) and sitting for even a short while in most every other chair makes my back hurt - I look like a little old lady getting up. Sitting in theaters, at the kitchen table, etc hurts. But .... I've been using this chair for work at my computer for about 2 years now and I love it! My back never hurts getting up from this chair! I'm so glad I spent the money and highly recommend it. $808.00 List Price: $1,283.00* The list price is the same as the MSRP (Manufacturer's Suggested Retail Price). It may not necessarily be the price at which the product is sold.